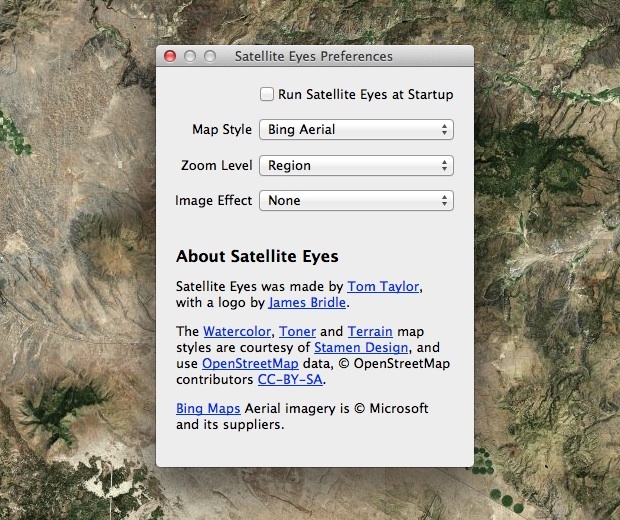 Satellite Eyes is a neat free app that automatically adjusts your desktops background wallpaper to satellite images of your current location. Commute to work and you’ll see a new background than what you do at home, fly across the country or world and it’ll change with you. For a simple app there are a fair amount of customization options to change how the wallpapers look. 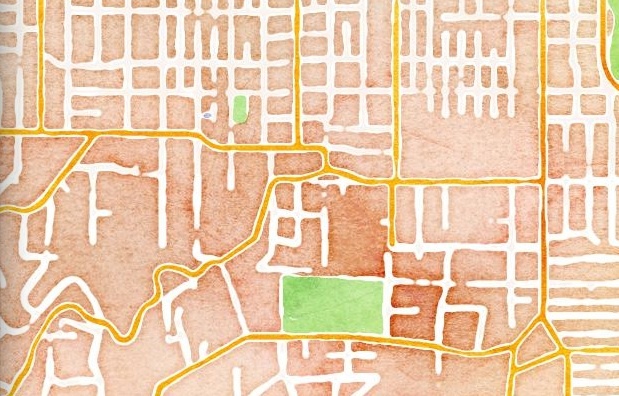 There are four different map styles, which include the generally attractive Bing Aerial satellite imagery, Terrain map which looks like a general map, Toner which looks pretty dreadful, and Watercolor which is exactly what it sounds like. Additionally, there are four different zoom levels, including Street Level, Neighborhood, City, and Region. The City and Region options can look either really great or really awful depending on how good the satellite images are for the area and how much terraforming human lifeforms have conducted in your region of planet Earth. If your setup includes multiple monitors you’ll find Satellite Eyes is smart enough to extend the imagery over each display. If you don’t want Satellite Eyes to automatically adjust the wallpaper as you change locations, you can open the app once at a select destination and then quit, the background picture stays intact. 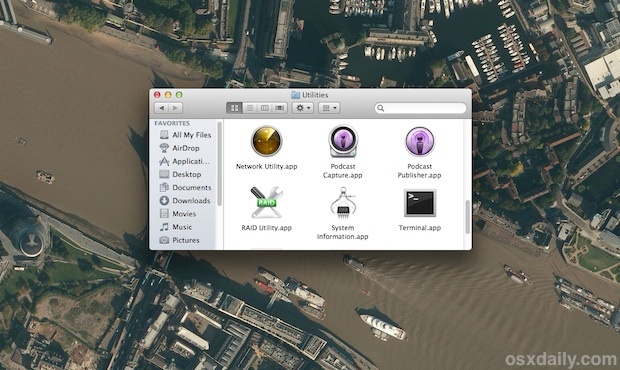 The app uses Location Services in Mac OS X in order to function, meaning you’ll need to have them enabled for the satellite image to be accurate. The Preference panel is accessible through the menubar and includes a fair amount of customizations. This is showing regional view. Seeing Neighborhood view painted in watercolor is abstract and attractive. Not a fan of pictures of the planet from satellites? That’s ok, we have ten gazillion more wallpapers in our archives. Cool app idea, though it’d be even better if we could select a region on a map to set. Such an amazing app, already fallen for it! So yet another company collecting data on your movements then. The chances of anyone giving two craps where you personally are, are probably none. You aren’t important enough, trust me. Nice idea, but I would prefer it as a screensaver, especially if it slowly zoomed out or moved around the neighborhood and region, if not the globe. Screenshots look like Utah or Colorado? No good for me, I use mission control a lot all 6 pages of the same map? including dashboard =(7) give a break.